From now on (that is from March 30, 2017) you will find all our reviews compiled into one large guestbook! So far, they were somewhat difficult for guests to find. We are, of course, happy about any further reviews you may have, posted either directly on this site, or via the well-known portals like Tripadvisor, Rent-a-guide or Getyourguide. Thank you very much for your support! With your reviews you not only help us design tours that meet the needs of our guests better, but also help others find the city tour most suited for them. I took the Richard Wagner tour of Dresden with Saskia. It was a individual tour, so Saskia personalized it and made it so informative and interesting. Not only did she tell me all about Wagner’s life and activities when he lived there but also taught me about his predecessors and contemporaries. Saskia is a musician, so she has the first-hand knowledge of musical life in Dresden, too! As she took me around the old city, Saskia also gave me a preliminary tour of the city, too, so by the end of the 2-hour tour, I had gained so much knowledge, and it made the rest of my stay there immensely enjoyable. I had meant to take the group tour of the old city as well but simply ran out of time because the length of my stay there was limited. I had arranged this tour in advance, and my communication with the company regarding the tour had gone smoothly, too. I definitely recommend Saskia as a guide and the Dresden Walks to anyone who wants to learn about the city and its people. Guide was engaging. Great at telling the history of Dresden. 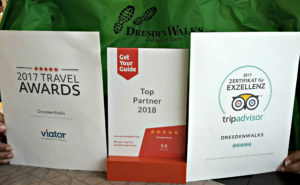 Deze tour was een leuke en interessante introductie voor onze citytrip in de overweldigende stad, Dresden. We took this tour on 23rd July, and thoroughly enjoyed. The guide Seema Prakash was very knowledgeable. Of particular interest was her pictorial explanation of various events in the history of Dresden. Would highly recommend her tour. Our guide was very knowledgeable and had pictures to show before and after in our stops. Would def recommend. If you are a student, there is student discount. We saw all the city center and the most historically important sites in Dresden. Seema answered all our questions patiently and with so much knowledge. And walked us slowly through the city providing us with stories and facts. All very easy. I recommend this walking tour company (& Seema). Quality experience. Walking tours are the best way to see and experience a city. personally taking a walking tour with well informed guide such as this is important for me whenever i visit a city. For Dresden this tour is very convenient since historical sites are so close together. I feel like we don’t do a lot of walking but we get the information needed. We learnt so much about the history of Dresden,including the time as part of East Germany and since reunification. Our English speaking guide Katarina was excellent and I would highly recommend this tour. We did the afternoon old town walk with Seema in late September and were really impressed with her passion for Dresden and how she related its very interesting history. We especially appreciated the extra WW2 history that she incorporated into the tour when she found out this was an area of particular interest for us (luckily we had a very small group). We saw several interesting places that we wouldn’t otherwise have noticed. We didn’t cover as much physical distance on this tour as we did on walking tours in other European cities, so this may be a good choice for anyone with mobility issues. The meeting point wasn’t really that obvious to us – look out for a green sign at the bottom of the statue steps in Bruhl Terrace. The Lady at DresdenWalks, who coordinates the tours is brilliant. Always very keen to offer you the best tours taking all of our requests into consideration. She went the extra mile for us in responding very fast to all enquiries showed extraordinary customer services. Our tourguide Manuela G. is as good as gold. Not only, that she speaks perfect Japanese, but she understands to impart her profound knowledge about Dresden and its history in a very vivid and adorable manner ! She took us through Dresden old city and accompanied us to Meissen. During the train ride to Meissen she gave us a lot of interesting background and advises about the villages, we passed. Wholehearted thanks to DresdenWalks (Jana and Manuela) our trip was memorable. A very easy going walk around Dresden to ensure you hit all the highlights with the added benefit of great commentary. Jana and her little son were great! Seema was a great historical guide! The Dresden Walking tour provided a nice summary of the history of Dresden (1100-present).Seema was knowledgable & most helpful in our 2 hour lesson of Dresden. We took this excellent walking tour with Karen who is a specialist in Art history. She gave us a wonderful insight into the history and culture of Dresden so that we could appreciate the art and architecture around us. The tour was full of historical background and anecdotes from the Middle Ages to Post-War which brought the places alive. We only had a short time there but were able to choose a couple of museums to visit later on her recommendation. She was pleasant and friendly too – we shared a bratwurst on the street after the walk. Our guide(Claudia) was wonderful. She was so friendly and easy to talk to as we went through some of the most beautiful areas of Dresden. She answered all of our questions and left us with recommendations for things to do during the remainder of our time here. We had a wonderful afternoon tour in the old part of town. Our guide Seema met us at Treffpunkt Schlossplatz. We were really impressed with her great depth of understanding of Dresden and how she related its very interesting history. She was able to answer many question from our group which made if feel like a private tour. WW2 history she included in the tour gave us a better appreciation of the rebirth of the city. The tour has just the right duration to give you an orientation of Dresden. It was for the Altstadt. May be there is something for Neustadt too but I don’t know. Our guide Helga who was actually filling in for the regular guide, was very knowledgeable and was happy to answer our queries. One thing which was particularly noticeable about her was that she paid attention to each individual despite it being quite a big group. Definitely recommended. 12€ per person for about 1.5 hrs. The meeting point is at 2:30pm at the stairs indicated on their website. The key is, the sign for the tour and the guide are just around to the right of the bottom of the stairs as you face them. It’s kind of easy to miss with all the activity in the square there. Claudia spoke good English and presented us with an efficient overview of the city and it’s interesting history. We saw many sites that we felt were covered sufficiently we didn’t have to return to them. A walking tour is such a great way to get your bearings when just hitting a new town, am comfortable recommending this tour. Would really recommend dresdenwalks. 12 euro for a 2 hour tour of the the old town including schloss platz, the churches, parade of princes and zwinger among others. She starts with a short orientation about Dresden and shows us photos as we go along. She brought along her little boy who I found super charming. Meeting place is daily at 12noon at the steps of Bruhns balcony. You can reserve or pay online. My wife and I went on this tour. Our guide Seema was outstanding. Very knowledgeable about Dresden history and she engaged the group by asking questions, getting everyone talking, and making sure all questions were answered. The 90+ minutes flew by and we felt this gave us a great base to start and focused us on items we wanted to see further during our stay. Price to value is very high with this tour group. We were most fortunate to have Seema as our guide. She made it all very interesting and was able to respond to all our questions. Overall a very good introduction to Dresden. We did this walk on an Early April Monday. There were 8 people in total on the tour. We learned a lot about the history of Dresden, although framed in the medieval history, the walk also covers 20th C events and more recent occurrences. The history was brought alive through tales, buildings and the odd picture. I would really recommend this tour. Wonderful way to get your bearings in Dresden. Seema is a fun and knowledgeable guide with a great grasp of the layers of history and politics and culture. We also appreciated her willingness to tackke many questions and her humanity in responding. The walk is really quite short in terms of distance, but wear sunscreen. I stopped by Dresden for a day on the way to Berlin from Prague not knowing what to expect so I booked this tour. This is a great walking tour to find out a little more about Dresden and its rich history. The historical walk covers most of the sights in the Old Town, which are quite close to each other in proximity and would be great for those who don’t want to be doing too much walking. Our guide Jana led us through various parts of Dresden’s history, touching on different eras ranging from the Augustus the Strong, to the WWII bombings, living through the Communist era and then life after the reunification. From Jana’s explanation, it is obvious that Dresden was once a great city and now rising from the ashes again. The walking tour price is 12 Euros – very standard based on the many walking tours I have taken throughout Europe. I would love to join some of the other DresdenWalks the next time I’m in town. Our guide, Jana, was very informative and knowledgeable, and it did not seem possible when the 2 hours were up – time just flew! You were not battered by a load of facts but information was imparted in an easy and conversational manner, which made it easy to absorb. Unfortunately it was wet but but it did not detract from what we saw or the tour. A worthwhile way to spend 2 hours visiting this lovely city. Did a really Nice tour today on februari the 28th 2017. The girl, I forgot her name, knows a lot of Dresden, If u want to do a quick tour of the history of Dresden its a good tour! £ 12 is great value for this 1.5-2 hour tour. Seema, our guide was sooo knowledgeable and friendly! Couldn’t recommend this tour enough, really gives you a vibe to the city to help you explore more! Our Guide was phenomenal! She is a native Dresdener who grew up American amount the ruins of Dresden after the war and under Soviet Occupation. We did a short 2 hr walk and learned so much. It was a great way to get a sense of old town and learn about Dresden. I give my highest recommendation for this. The guide was very knowledgeable and provided excellent commentary. The guide had extensive experience having lived most of her life in Dresden. She was able to provide a historical perspective on each element of the tour. She was willing to share her opinion on a range of issues and went out of her way to make the visit informative and stimulating. Her recommendations on further activities were excellent. This was an absolutely wonderful tour, our guide was excellent and she told us a great mix of history and funny stories about the place. I wouldn’t have had half the appreciation or understanding of what I was looking at without this tour. Highly recommend!!! This is a wonderful little walking tour. Although it is compact and doesn’t cover a great deal of territory, it does cover quite a bit of history. Our guide, Seema, was both well-spoken, and well-informed. In addition to the walking tour itself being wonderful, the communication via email with staff beforehand was great. My wife inadvertently signed up and bought tickets for a German-speaking tour, but this was rectified via email and we had no problems when we arrived at the meeting point. A great introduction to Dresden! Our guide was fantastic, she took us through the old town and to most of the big sites. We didn’t go in any of the places, rather it was a high-level preview of the city, perfect for orienting you when you arrive. There’s not too much walking, a guy with a cane could keep up. Since it was December she even gave us information about local Christmas customs! Our guide was informative and informed; showing an excellent depth of knowledge, enthusiasm, and commitment to delivering a great tour. A real pleasure and good overview to the city. Tour was excellent and Katharina made it a fun experience for all. We keep a very nice memory of our stay and will be back in Dresden! I took the tour on the 10th Oct and loved it! My guide (sorry I’m bad at remembering names) was brilliant, friendly, very passionate and was able to answer all our questions. Dresden is a beautiful city and I’d highly recommend it and this walking tour. Thank you so much!! As someone who is interested in the history of the places we go, I felt this was a great tour. We went with Thilo (I think that is how his name is spelled) and he gave one of the best tours I have ever been on. He helped us understand the origins of the city and did a great job answering any questions we had. I would take this tour over any free walking tour I have been on. I so enjoyed your tour of Dresden with Susann on Sat, Sept 24 at 2:30. I just posted a review on Trip Advisor, but also wanted to let you know what a great job she did. I’m also copying the review I posted on Trip Advisor here so that if you have a place on your website for reviews (that I didn’t see) you can post it there if you wish. The one thing I forgot to include was that as it turned out that day, I was the ONLY person on the tour. Susann was so extremely gracious and generous with me in sharing information about your amazing city. And she mentioned that your company is careful to keep groups small all the time, even bringing in extra guides if needed to split up a larger group. So, anyway, I just wanted to thank you – and Susann, again for a great experience in Dresden. Her tour was the highlight of my time there! I love to explore the history of the places I visit, and so enjoyed a fantastic walking tour by Susann while recently in Dresden. She’s got a degree in Medieval History of the area, her English was perfect, and she gave me just the right amount of information in the two-hour tour without overwhelming me. Dresden is easily walkable, and she gave me such great information about Dresden starting with the original “swamp people” of Dresden and later Augustus the Strong, and then guided me through so many great historical sights including the Zwinger, the former royal palace and grounds, the Opera House, and of course, Frauenkirke, providing insights I never would have known without her, and photos of what places had once looked like. Highly recommended! Worth the money. Really comprehensive and clear explanation of Dresden, history, culture, architecture and contemporary attitudes towards conservation and preservation. Great and tailored recommendations for what to do after, very comfortable group Size and personable guide! Le 12 août 2016, j’ai fait la visite guidée en anglais du centre historique de Dresde . Seema, notre guide, était très intéressante, de bonne humeur et répondait à toutes les questions. Cette visite guidée m’a fait gagner du temps dans la visite de la ville. I was in Dresden just for a day and took this tour. I couldn’t have made a better choice. Our Guide Seema Prakash was very good. She was very thorough with all details about the place. She had answers to all the questions we asked her. The tour was well planned with enough time at each spot and just the write amount of walking. Her tips about other things that to do in the city were also very helpful. Very good way to learn about the history and the contemporary life of the city in the least possible time. Strongly recommend. A New York native, after 16 years in Germany involved in architectural restoration Karen‘s extensive knowledge was matched by her passion for the history and buildings of Dresden. 2 hours were over in a blink and we could’ve done two more. Cannot recommend highly enough. Thank you very much for accommodating our last minute request. The tour was very informative and given us a background in understanding this lovely city much better. We enjoyed our afternoon tour with Katarina. We learned of the history of the many historical structures that have been well reconstructed since WW II. Dresden is really a gem of a city with both interesting older buildings and many new buildings constructed since the reunification. Did a wonderful historical walk through the old city of Dresden. Seema, our guide was excellent… Passionate and so informative. She explained the history of Dresden so well and as we were such a small group it felt so much more personal. I find going on a guided walk when you arrive in a new city , it just adds so much to the experience. Would recommend Seema as a tour guide anytime !!! Hicimos el tour en inglés con Karen, conocimos muchísimos puntos importantes de la ciudad en un tour de 2 horas por el centro histórico. Sus explicaciones fueron muy claras, divertidas y se entienden a la perfección. I had a short 6-hour stint in Dresden, and I decided to spend 2 of those hours on DresdenWalks to learn more about the city. It was certainly time well-spent! Seema was an excellent tour guide, the price was modest (NOTE: discounts for students! ), and the group size was small (they cap the group at around 20 people, and my tour had about 10 people). I recommend the tour for people passing by Dresden or as a “Day 1” activity for someone’s extended stay in the city. Excellent tour by engaging historian. Our knowledgeable guide illuminated Dresden’s long history with memorable facts, a local’s insight, and a sense of humour. She also gave us really useful tips about what to seek out to get best views, best value. Highly recommended! Thoroughly enjoyed the tour, the guide was good and very knowledgeable and I would have happily agreed to a longer visit. Katerina spoke eloquently and with good humour. She obviously enjoys her city and her job. was quite a character. Bring your voucher by paper or phone. We forgot ours, but Katerina was forgiving. Really enjoyed our tour with Carol in early May. She gave a great overview of Dresden which set us up for the rest of our time there. The group was small, her English and manner excellent and I would recommend doing this. Carola is a Dresden native and a fantastic guide. She spent almost two hours with our group, walking us through the monumental buildings of the Old Town, weaving together centuries of history. I particularly enjoyed the part when she took us into the cathedral, and asked us questions, leading to a whispered and engaged discussion, really bringing the history of the building to life. Thanks for the great tour. I will definitely recommend it to anyone I hear of heading to Dresden or towards Berlin. I visited Dresden with my parents last week and took a wonderful tour with Carola from Dresden Walks. She is a native German, has lived in Dresden for many, many years, and knew the city very well. Seema, our guide did an excellent walking tour of the historical area of Dresden. She did a wonderful job of explaining the history and subsequent reconstruction of this area. A very well spent two hours!! It was a pleasure to get some historical background on the city of Dresden and it’s fantastic architectural gems in the old city. Seema, one of several Dresden Walks guides, led us through the layers of history, ancient to modern. In 1 3/4 hours she demonstrated mastery of the subject while showing real respect for tour group members. Well worth the modest price. Seema was an excellent guide. She provided very interesting historical information. My husband and I would not have enjoyed our week in Dresden nearly as much if we have not taken this tour quite soon after we arrived. Karen provided the perspective of someone who has lived on both sides of the Atlantic and has studied the history of Dresden. This tour was everything I hoped it would be: a bit of history, a bit of geography, and a bit of landmarks/museums. I go on city walks wherever I visit, and I know what makes a good tour guide; Seema seemed to have it all. The walking tour is an excellent way to introduce yourself to the fascinating history of Dresden and orientate yourself around the Old Town. Our guide had lots of interesting anecdotes that made the experience very immersive. I try to start all my city visits with a good walking tour so you can really place what you are seeing in context – this tour did exactly that and was a really fun way to spend two hours. We did the English language tour of central Dresden on 29th March. Katherina was a superb guide. I had an excellent tour called Psychology Writes History. This was among the most interesting and thought-provoking of the tours I had during my time in Germany. Spent over 2 hours in Janni’s company today as she guided 2 of us through Dresden’s interesting architecture and history. She was a knowledge guide, with a lovely sense of humour and honest responses to my ‘awkward ‘ questions. Highly recommended. Wonderful tour, makes simple architectures much more meaningful and interesting! I went to dresden on January, on the most quiet time of the year. I was the only one that day, and it was totally amazing to hear to the whole story from the beginning of dresden to how it is now. A nice walk through the main tourist attractions of Dresden. The guide Friederike Kuner was very good and polite. Gave us a lot of interesting information about the places we went. Took the 12 noon walking tour on 25 September. Our guide, Carola, was very well organized and really knew her stuff. I thought she struck a nice balance in how she covered the history and architecture of Dresden. The route of the walk was also well designed in that there was very little doubling back. The tour lasted just shy of 2 hours and cost 12 Euro. She was very helpful at directing us to the best spots for photos at the different locations we visited. Also, she had some nice photos showing how many of the buildings which were destroyed or partially destroyed during WWII looked prior to their being rebuilt. Seeing those photos and comparing them to how Dresden looks now really gives one an appreciation for all the effort that has gone into the rebuilding of the city. This walking tour exceeded all my expectations. Our english speaking guide had impeccable credentials and vast knowledge of the revival of Dresden. We loved Dresden and both tours were great. The VW plant was simply amazing – the Green Vault even more so! I have to confess that we were too tired and it was simply too hot to visit Sächsische Schweiz. I will have to return And do a Saxony only trip sometime! I have put your itinerary in my travel file. So thank you for organising everything! Great tour. Karen was the perfect guide for this walk in the beautiful city of Dresden!!! Thanks for organize this!!! Take good care and have a nice weekend! Jana, our tour guide was fantastic. We learned so much about Dresden past and present and were amazed at all the hidden gems in the city that you just wouldn’t know we’re there without someone to show you. One of the best things about the tour is the price, it is a small price to pay for such a great introduction. Since we do have a lot of guests from all over the world our tours are not only for native speakers. Nous avons fait le tour de la vieille ville de Dresden avec Seema, le 12 juillet . Elle possède une excellent connaissance de son sujet. Elle était ouverte et sensible à son auditoire; deux familles de jeunes enfants nous accompagnaient. Elle a adapté son itinéraire en fonction de tous. Elle est passionnée et répond de façon très complète à nos questions. Nous avons trouvé le tour très intéressant et nous le recommandons à tous! Thanks very much. It was a wonderful walk you gave us and we very much appreciate it. The website however wasn’t quite so cooperative as you! Thanks for fixing it all up. Seema, our guide, was easy to follow, very knowledgeable, friendly and professional. We weren’t rushed and had a fabulous 2 hours to learn about how psychology writes history. It was the highlight of our holiday. The walk brought a tragic past era in the history of Dresden to life. This walk is highly recommended for anyone who is interested in life in Dresden before, during and after the Nazi era. We took your Old Town tour 2 weeks ago and really enjoyed our tour. Our guide was Suzie. I was starting to label my pictures and found one that I couldn’t identify. Could you help me? Our lovely guide Seema waited for us – despite rain and shine. Incidentally, as soon as it was time to start the walk, it stopped raining and the sun came out. How about that! Our walk started promptly and we covered a fair bit in the 2 hours – from blackened buildings to newer reconstructions. If you’re curious about the Zwinger (why was it built, and to impress whom), where to see a good example of communist-style architecture (ugh! ), what happened to the Frauenkirche during the war and its rise again (a sad story with a happier ending) — ask Seema and she’ll fill in the gaps for you in a most interesting way. The best part was seeing the “Procession of Princes” (“the frieze”) with its hidden messages… you’ll just have to ask Seema. She was so knowledgeable, patient and full of interesting anecdotes, stories and facts – if only history was taught in this fascinating way in school, I’d have aced the subject! Suzi took us on a roughly 1.5h tour through the old town of Dresden – it was the perfect way to see the city and she was absolutely full of knowledge. She shared personal experiences that occurred during GDR times and was more than happy to answer all questions. Suzi focussed on making the tour a celebration of the Florence on the Elbe rather than purely on the events of 1945. If you have 2hours, then take this tour. I have been on two of these walks, with different guides and both were Excellent. A 2 hour tour which takes you around the critical sites, giving you information about the great city, so you gain an understanding and feeling for what you see around you. Not too long, nor too short, an excellent starter, giving you food for thought of where you may want to go to next and explore further (if you have time). I took a private tour of the old city with Claudia. It lasted 2 hours. She met me at my hotel promptly. She is very professional and passionate about the history and architecture of Dresden. We covered a lot of ground at a pace that was comfortable for me. She was very flexible and willing to answer all of my questions. I highly recommend a tour with Claudia and feel the cost was worth it since I was in Dresden for one night and wanted to get the most from my visit. Claudia has the ability to focus on what is significant and share in a clear and concise manner. Great insight into an interesting city! Hubby and I joined Karen for the DresdenWalks Old Town tour and had a wonderful experience! Karen was very knowledgable and eager to share what she knew! The tour covered the early history of the city and it’s rulers, it’s stunning architecture as well as the more recent history for which Dresden is more widely known! A great way to orientate yourself and get some insight into a very interesting city! Debbie & I did your 11am English tour on Thursday 11th October. We enjoyed the tour content. The guide – Janna was very knowledgeable and passionate about Dresden, but with a good sense of humour to go with it.